The PMI is an important economic release and should be watched by every trader. It stands for Purchasing Managers Index and, in fact, it is a survey. Is the company looking to hire more people or not? Is the company looking to fire people? How is the business activity seen six months from now? All these are just examples of questions that must be answered, and the result is averaged among industries and sectors in an economy. Depending on the nature of an economy, the PMI’s can take various shapes. To give you an example, in the Eurozone, the PMI Services and Manufacturing data is released, while in the United Kingdom and Australia, the PMI Construction is also considered. In the United States of America, there is no PMI release! This is not because the U.S. is not looking at the PMI, but simply because it has a different name. 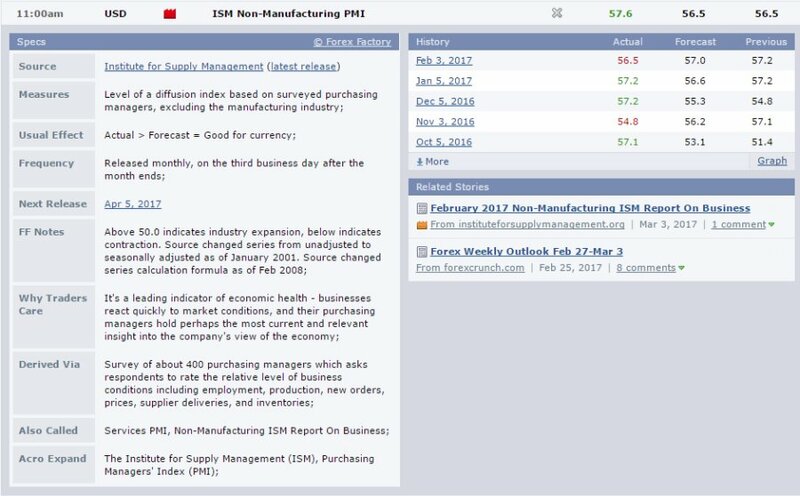 The ISM Manufacturing and Non-Manufacturing are showing the same thing like the PMI’s in the rest of the world. ISM stands for the Institute for Supply Management, and Non-Manufacturing means services. As simple as that! Why Are the PMI’s Important? The PMI’s are extremely important in an economy, or, to be more exact, in predicting the shape of an economy. Because of that, they are important for traders as well, because if one can predict the shape of an economy, it means he/she can predict the future strength/weakness of its currency. How to Interpret the Release? Before anything, it should be mentioned that the PMI’s are released monthly, no matter the economy they are referring to. It goes without saying that, in a service based economy, the PMI Services is more important than the manufacturing data, and the currency will fluctuate more when the services data is released. To give you an example, imagine the economy of the United Kingdom. This is a service based type of an economy and what happens with the services sector is key. If the PMI Manufacturing or Construction data is released and it disappoints (meaning it is coming lower than the market expectation is), the currency may react negatively. However, if the PMI Services is still holding on and keeps a rising trend, the negative data will be shrugged off and the currency will strengthen again. Why? Because the U.K. economy is a service based one! When it comes to the PMI’s, it is all about the 50 level. This economic data is interpreted based on the 50 level. As a rule of thumb, a sector that shows a print higher than the 50 level, is considered a sector that is growing or expanding. This is bullish and should support a currency. On the other hand, a sector that shows a print below the 50 level, is considered a sector that is contracting. This is negative for the currency as the implications are that the economy is in recession (or a recession is following) and the central bank will lower the interest rates next time the governing body is meeting or at least it will use a negative or bearish tone in its press release. However, not any level is desirable! A print over the 60 value is not welcomed as central banks will be worried that the economy is overheating. Like it is in the case of inflation, a normal PMI level for an economy that grows at a constant pace is somewhere between 54 and 58. Anything below, and the central bank starts worrying, anything above and the central bank starts worrying again! The image above shows the ISM Non-Manufacturing release as it is presented in the economic calendar. The actual release was 57.6, higher than the 56.5 forecasted and higher than the previous release, from one month ago. It is a bullish print and it should be met by dollar buying. Such a solid print shows the services sector, or the non-manufacturing one, in the United States, rising, and this will put pressure on the central bank to raise rates or to start talking hawkish at the press conferences or in future statements. Moreover, the U.S. economy is a service based one, so this data should be crucial for the overall state of the economy. Consequently, the currency will move aggressively. Traders are looking at PMI’s to form an idea about the shape of an economy and to position for the next central bank decision. The interest rate decision is all that matters for the currency market. If the PMI’s show an economy that is improving, rising and growing at a steady pace, in the end, the central banks’ mandate will be fulfilled and the interest rates will rise. Higher interest rates always result in a higher currency! However, there is other information to look for in a PMI release. This is especially true in the United States when the ISM Non-Manufacturing data is released. You see, the Fed is having a dual mandate: that is, to keep inflation below or close to two percent and to create jobs. While inflation is on every other central bank’s mandate, job creation is not. This makes the jobs report in the U.S. especially important for the currency market, and not only: stock market and other markets like the bond and options one are affected as well. To be more specific, the Non-Farm Payrolls (NFP) that is released on the first Friday of every month is the data to watch. If more jobs are created, the dollar is bought. But, before the NFP, the ISM Non-Manufacturing is released, and the employment component sometimes matters more than the actual PMI print. After all, trading is all about positioning for the next interest rate move. If it is going to be a rise, the currency will move to the upside, and to the downside if it is a rate cut. No matter the source to take the information from, the interpretation is the one that matters!